Teaching the start of an earlier beginning beekeeping class in Rolla, Mo. 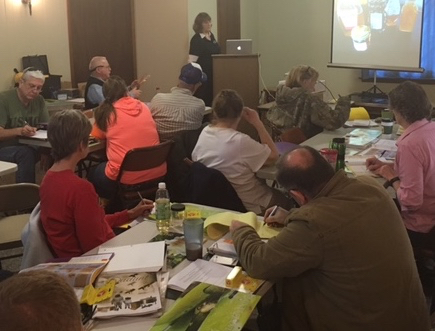 Looking forward to meeting new potential beekeepers at our next beginning beekeeping class in Rolla, Mo. on Saturday, January 27, 2018. Registration is now open for the beginning beekeeping class Saturday, January 27, 2018 at Brownwood Estates Clubhouse, 1341 California, Rolla, Mo. from 9 a.m. to 3 p.m. Cost is $50 per person including a beginning beekeeping book, natural events calendar, beekeeping diary, catered lunch and refreshments. Class size is limited; attendees must be at least 15 years of age or older. To pre-register, send your name, email and phone number to rollabees at gmail.com and a check to David Draker, 1951 Monterey Drive, Rolla, Mo. 65401. Gift certificates also available, email check and details to rollabees at gmail.comwith payment. The basic beekeeping classes will include basic bee behavior and biology; beekeeping equipment needs and costs; how to properly use beekeeping equipment, how to set up bee hives; basic pests and diseases and how to help bee colonies get through their first winter. David Draker, right, guides a discussion at a monthly Rolla Bee Club meeting. This class has a local beekeeping club that supports beginning beekeepers with monthly meetings at the same class location from 2 p.m. to 4 p.m. Both classes qualify for Phelps County Master Gardeners continuing education and Meramec Hills Chapter Master Gardeners advanced training. Rolla Bee Club is sponsored by Bluebird Gardens Foundation, a charitable foundation part of the Community Foundation of the Ozarks.